The Cubs have been dinged up quite a bit this year - we're not reaching disaster levels, but let's just say that the trainer's room has been quite busy in the season's early going. So far, Anthony Rizzo's back, has already landed him on the disabled list once, further hampering an already inconsistent club and necessitating the call-up of journeyman, Efren Navarro. Furthermore, over the weekend, a couple of additional injuries resulted in another pair of roster moves - Ben Zobrist's back has been barking and apparently Eddie Butler's hamstring has been tight. Going into a series in Colorado with a short pitching staff or bench is never a good idea, so both were immediately transferred to the DL, although all signs point to minor issues. 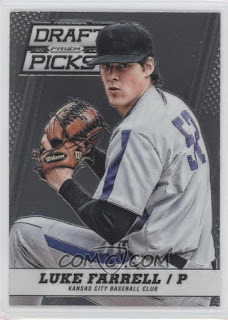 Although I have a large stockpile of cards featuring Cubs prospects and recent minor league signings - set aside and ready to move into the CATRC - the roster moves of 2018 have thwarted my best efforts at being prepared. As with the Navarro move, both names called up to the Major League Cubs this weekend are entirely unrepresented in my collection - womp, womp. However, as shown off in my post about Navarro, I recently created a fully customizable Topps Now template, which I fully intend to use to create "cards" of these players in order to temporarily fill these newly opened gaps. Utilityman, David Bote, went from organizational filler (18th rd, 2012 draft) to bonafide Major League prospect in the span of two years. 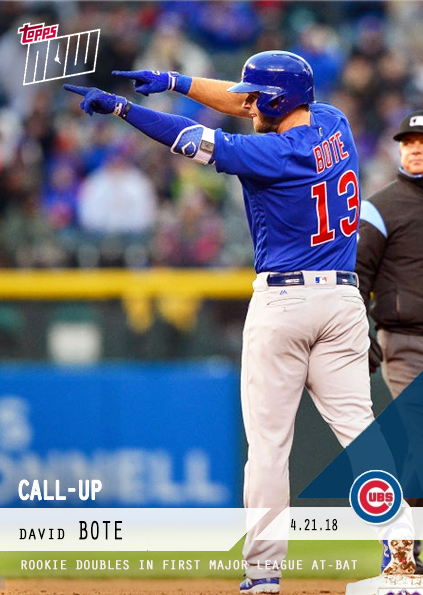 When Zobrist went on the disabled list, the only infielder on the 40-man available was Bote, who came up and promptly doubled in his maiden MLB plate appearance. If that wasn't storybook enough for you, the young man just so happens to hail from the Rocky Mountain state and much of his family was in attendance for his bang-up debut. Unfortunately, that was about the only highlight in what was the Cubs' only loss in that series, but those good vibes were hard to shake. Not only is Bote completely absent from my collection, outside of minor league team issues, he is entirely unrepresented in the baseball card world. As I alluded to, much of his professional career has been spent as an org guy - it wasn't until a breakout 2016 and a outstanding Fall League last year that Bote caught the attention of prospectors. 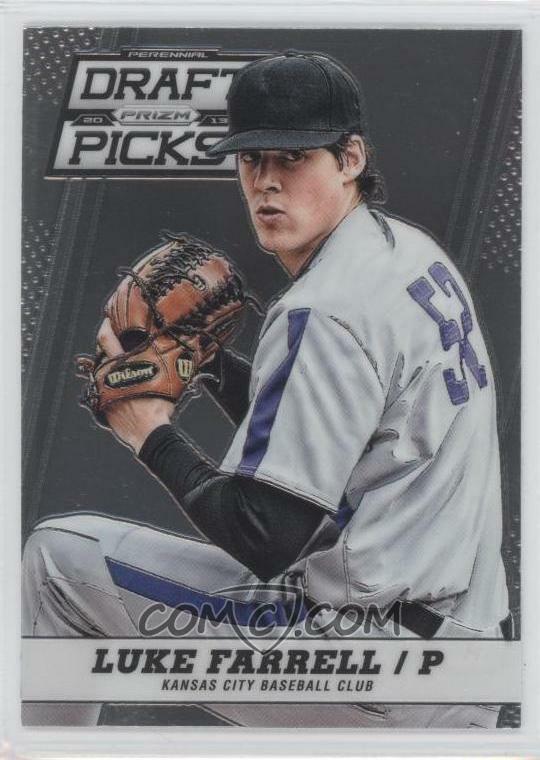 Coincidentally, his mainstream cardboard debut will occur in the upcoming Bowman checklist - how timely! Luke Farrell rode the waiver-wire roller coaster over the winter before eventually clearing and being assigned to the AAA Iowa Cubs to start 2018. 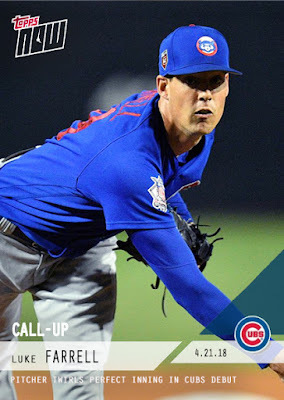 Seen as intriguing starting pitching depth by Theo and crew, Luke's presence was needed far earlier than anticipated when the heavily-used Eddie Butler's hammy started barking. Going into a series at Coor's Field without a long reliever would be a fool's errand, so the Cubs called upon their farm club's freshest starter, who just so happened to be Farrell. The pitcher also made his debut in the same tilt as Bote, twirling a perfect inning with two strikeouts in the loss. Despite his excellent showing, Getty Images apparently turned off their cameras by the time Farrell made his way onto the field; so, I was forced to pilfer an image from Spring Training for this custom Now single. Unlike Bote, Farrell had some hype after his drafting and came with a marketable and familiar family tree. As such, the moundsman has snuck into a couple of mainstream products - 2013 Panini Prizm Perennial Draft Picks and 2013 Panini Elite Extra Edition (auto). They're not particularly attractive cards, but they'll get the job done for now. 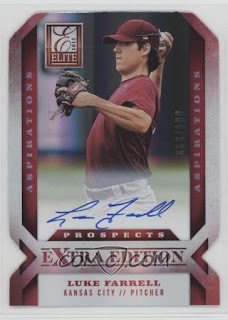 So, if anyone has one of these super-duper shiny Farrell cards sitting in their trade stacks, I'd love to take them off of your hands! Furthermore, if anyone pulls a Bote when they bust their Bowman orders on Wednesday, again, I'd be happy to swap. In the interim, I am glad that I have these Now customs on hand. I suppose I will continue to pump these out as other players make their North Side debuts throughout 2018 - there's bound to be more, after all. Welcome to Chicago, David Bote and Luke Farrell! Nice cards though I'm not sure why Bote didn't get an actual Topps Now card. I know he's not a big name but Topps didn't think they could print money on that one with all the Cubs fans? Even the lowest Cubs print runs are over 200. Bode's double was a great moment -- glad I got to see it live as it happened.